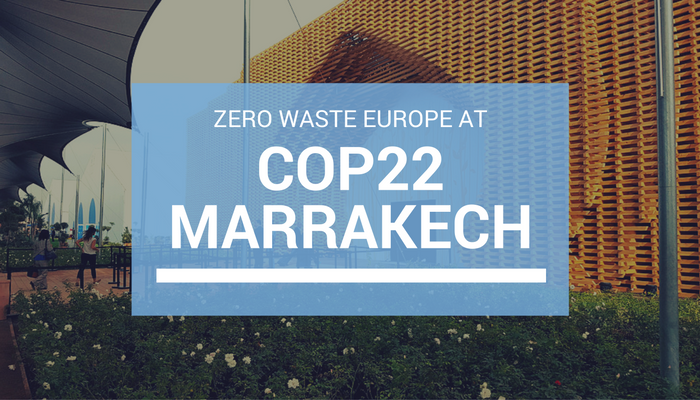 Despite the fact that COP 22 will sadly go down in history as the Trump COP, the Zero Waste Europe team did not miss the chance to participate in the climate negotiations and promote the work of zero waste cities, communities and recycling workers all over the world for climate action. During the first week and in collaboration with Cities Alliance, WIEGO, Alliance of Indian Waste Pickers and UNEP, Zero Waste Europe co-organised the event Sustainable Solid Waste Solutions for Communities and Climate Change to discuss the best solid waste solutions for cities resulting in cleaner, greener and healthier cities as well as income generation and emissions reduction. Mariel Vilella, Zero Waste Europe’s lead on Climate, Energy and Air Pollution Programme, provided an introduction to the zero waste vision and its contribution to climate mitigation, as well as showed progress made by the Zero Waste Municipalities network in Europe and around the world. Vilella stressed the importance of including informal recyclers into zero waste strategies, especially in the Global South, where the millions of waste pickers are the de facto recycling systems. Precisely, the participation in the annual climate negotiations proved to be a challenge for grassroots recycling communities from the Global South once again. In this case the representatives from the Alliance of Indian Waste Pickers were not allowed to board their planes for no reason other than false claims made regarding their VISA documents, reminding us of all the prejudice and discrimination that vulnerable communities such as wastepicker women are faced with on a daily basis. In the civil society space, the “Blue Zone”, the Moroccan group Zero Waste Skhirat organised a space dedicated to reflection on the use of resources and wastage with creative reused items and a programme of workshops on the topics of reuse and recycling. In the second week, Zero Waste Europe’s Product Policy Officer Delphine Lévi-Alvarès presented the Break Free From Plastic Campaign at a side-event organised by the French Ministry of Environment to launch an international coalition of countries committed to “stop plastic waste” in the ocean. Lévi-Alvarès stressed that plastic pollution in the ocean is just the tip of the iceberg, the result of a linear and wasteful economy which we need to address by adopting a holistic approach and looking at the root causes of this pollution. In connection to the climate change debate, she highlighted that the twenty-fold increase of plastic production over the past 50 years has led to plastics using 6% of global oil consumption, the equivalent of the aviation sector but with significantly worse externalities. “If we keep doing business as usual, plastic production will increase twenty-fold by 2050, representing the 20% of the global oil consumption, offsetting the development of renewable energies and clean transport”, said Lévi-Alvarès, who invited the audience to join the campaign at breakfreefromplastic.org. Looking at progress made in the negotations, the Marrakech “implementation” COP – as it was nicknamed, in the hope of ramping up the sort of climate action momentum that should have followed the entry into law of the Paris Agreement – delivered a meagre yet necessary declaration (the Marrakech Action Proclamation), which reassured the global commitment with climate change in spite of the US election. Remarkably, 47 of the world’s poorest countries grouped together as the Climate Vulnerable Forum, launched the Marrakech Vision with a commitment to generate 100% of their energy from renewable sources as soon as possible. They also pledged to update their nationally determined contributions before 2020 and to prepare long-term strategies. Despite these highlights, it’s clear that after three years of breaking temperature records and with 2016 to become the hottest year on record, the climate crisis will not be solved with the current voluntary pledges to reduce emissions put forward by well-meaning governments around the world. Most importantly, pledges to reduce CO2 emissions need to spell out the actual strategies that will be implemented o reduce emissions, paying special attention to support the right sustainable strategies in all sectors, including zero waste strategies in the waste sector, which is the easiest, fastest and quickest way to deliver climate mitigation. Fully salute to the efforts done by ZW Europe, and hopefully, the same team spirit needed in other places in the world. Is the Global South takes fair position in this negotiation or is just “be with them but not among them”. Best practices with challenges from the Global South should be inclusively and seriously encouraged!